Last week we were lucky enough to spend a few days on the Isle of Skye in the Scottish highlands while on vacation back in the UK. It is one of my favorite spots in the world. The wind swept landscapes just mesmerize me, rain or shine. In fact, it's often a better experience in the rain and wind because, well, that landscape has been sculpted by those conditions and thus it just feels right. This is a part of the world that inspires me. Might be the Scottish blood that flows through my veins, but there is just something a little magical about the Highlands. Eilean Donan Castle just outside of Skye. 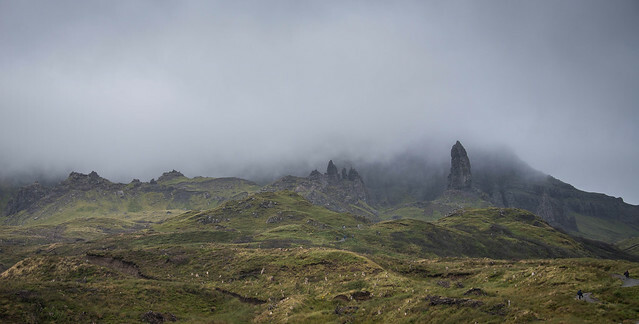 The Auld Man of Skye at The Storr - one of those spots that is best experienced on a wet and windy morning! Watching the clouds roll through the rock formations is such an amazing sight. This is actually a modern standing stone erected to mark the millennium. We stumbled upon it on the way to Dunvegan castle. The Fairy Glen near Uig in the north of the island. This spot is seriously tucked away, and the drive is a little precarious, but it's totally worth making the effort! Even the view as you leave is full of great scenic views! It is an amazingly beautiful part of the world and well worth the visit if you ever get the chance.